Mod of the F1 2006 season with the official 11 teams. 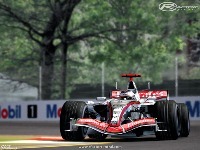 Mod representación de la temporada 2006 de Formula 1 con las 11 escuderias. There are currently no car skins available for XtremeRacers 2006. If you are a painter you can share skins for this mod via the Car Skins area. Visit the Spray Booth for painting tips & tricks. All the cars are locked. How do I get around that? Apparently the sound files are encrypted by ISI, and as a result when upgraded to 1.255f the sounds will not work. [exept the brake sounds and backfires etc.but no engine sounds whatsoever] And I've also read somewhere that you can substitute the xr06 sounds with the original rfactor bmwf1 sound pack.a way out I suppose.but then.who wants to drive a Ferrari that sounds like a BMW?.or any other car for that matter. [fine if you want to drive the BMW I suppose.but then every other car in the game will have the same sound...how boring and pathetic!!!] Some clever soul please help us! Hey Siegor! Did you fix your sound problem.because I've got the same bug too.....any help please! hey guys if anyone has watched onboard premiere live maybe you have seen how the cars steer this mod is the closest mod ever made to the real f1 handling and physics forget FSone MMG CTDP 2006 only CTDP 2005 can get a little bit closer but they are again very very far from here my only concern is that the cars can't get their maximum speeds on the straights on monza i get 323 with the wings on 12 and in the turns the car is not there at all any suggestions?